The combination meter assembly receives the vehicle speed signal from this circuit. The wheel speed sensors produce an output that varies according to the vehicle speed. The wheel speed sensor output is received by the skid control ECU which uses this information to create the vehicle speed sensor signal*1. The vehicle speed sensor signal consists of pulses sent to the combination meter assembly from the skid control ECU. To create this signal, 12 V is output from IG2 which is behind a resistor in the combination meter assembly. This voltage is sent to the skid control ECU. The pulse signal is created by switching the transistor in the skid control ECU on and off, making the voltage on the wire drop to 0 V. A similar system is used for the output of this signal from the combination meter assembly via terminal +S. A voltage of 12 V or 5 V is applied to terminal +S from each ECU or relay that is connected to this terminal. The transistor in the combination meter assembly is controlled by the signal from the skid control ECU. When this transistor is turned on, this transistor makes the voltage supplied by the various ECUs (via their respective internal resistors) drop to 0 V. Each ECU connected to terminal +S of the combination meter assembly controls its respective system based on the pulse signal. *1: This vehicle speed sensor signal is created by the skid control ECU. There is no actual component that is referred to as the vehicle speed sensor. In addition, for some other systems, vehicle speed information may be exchanged using CAN communication. This circuit is used for the systems connected to terminal +S. This signal is not used for combination meter assembly operation. 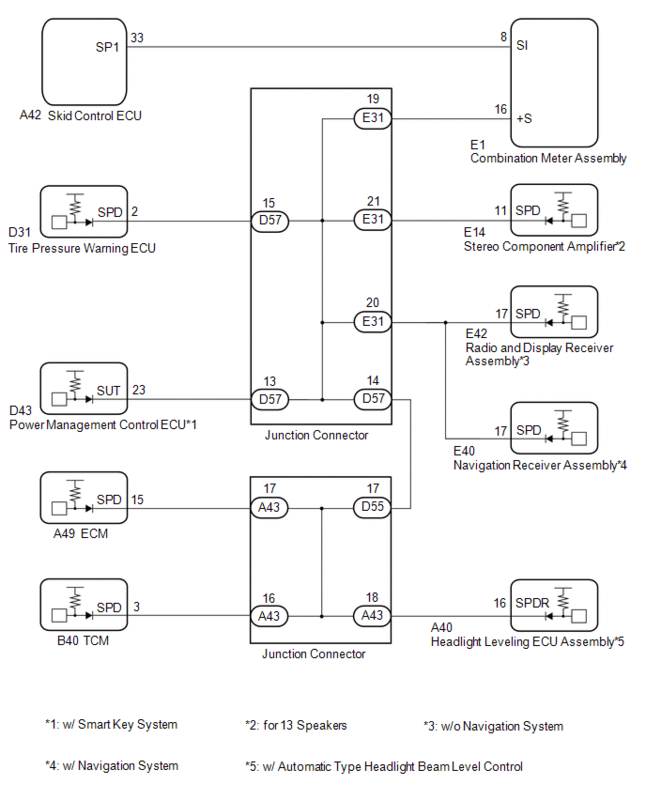 Combination meter assembly components such as the speedometer operate using data received via CAN communication. (a) Disconnect the E1 connector. If any of the ECUs specified in the wiring diagram supplies power to the combination meter assembly, the combination meter assembly will output a waveform. (a) Reconnect the E1 connector. (b) Disconnect the A42 connector. (a) Check the input waveform. (1) Reconnect the A42 connector. 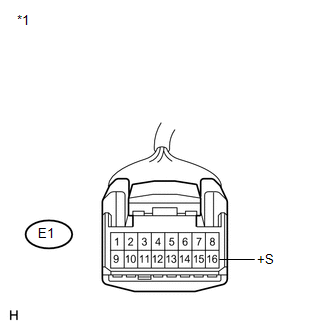 (2) Remove the combination meter assembly with the connector(s) still connected. 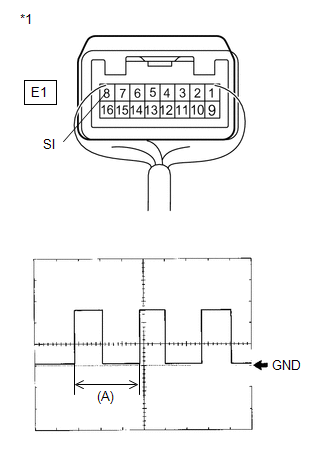 (3) Connect an oscilloscope to terminal E1-8 (SI) and body ground. (4) Turn the ignition switch ON. (5) Turn the wheel slowly. (6) Check the signal waveform according to the condition(s) in the table below. The waveform is displayed as shown in the illustration. When the system is functioning normally, one wheel revolution generates 4 pulses. As the vehicle speed increases, the width indicated by (A) in the illustration narrows. (a) Disconnect the E1 and A42 connectors. (a) Disconnect the E31 junction connector. (a) Check for a short in the circuit that is connected to the junction connector shown in the wiring diagram. If voltage is not present, it is possible that an ECU or circuit has a malfunction. 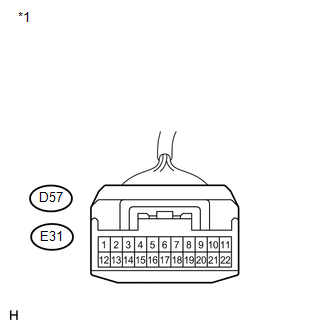 The malfunctioning ECU or circuit will be diagnosed in the following steps. (1) Disconnect the D57 junction connector. Voltage is not present in one circuit. Voltage is present in all the circuits. (a) Disconnect the D55 junction connector. (a) Check for a short in the circuit that is connected to A43 junction connector shown in the wiring diagram. (1) Disconnect the A43 junction connector. (a) Select the circuit in which voltage is not present in step 6. (a) Disconnect the D31 connector. (a) Disconnect the D43 connector. (a) Disconnect the E14 connector. (a) Disconnect the E42*1 or E40*2 connector. (a) Select the circuit in which is not present voltage in step 8. 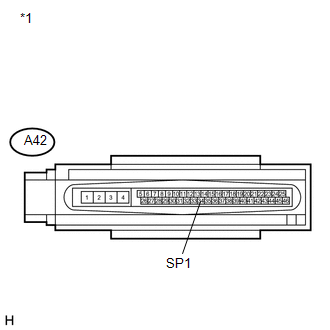 (a) Disconnect the A41*1 or A49*2 connector. (a) Disconnect the B40 connector. (a) Disconnect the A40 connector.